The Chancel Choir is a non-auditioned group of singers who meet on Wednesday evenings (August through June) from 7:15pm-9:15pm. 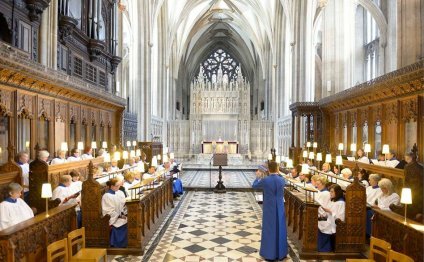 Currently the choir has over 170 registered members, and typical rehearsals will attract 110+ singers. The choir is comprised of people of all musical abilities; from professional singers and instrumentalists to those who have done very little to no singing. What opportunities does the Chancel Choir offer? Aside from our most important role of ministering to the church and to God through music as a choir, we also minister in other ways: mission tours outreach, and Tower Arts concerts, of which we perform 2-3 times a year. Repertoire of our Choir ranges from classical music (such as Handel’s Messiah to Christmas music, and more ‘pops’ and festive styles at the Memorial Day concert. We regularly perform with professional instrumentalists, whether it be a full orchestra or individual instrumentalists or small ensembles. Missy Fain finds joy in singing in the Chancel Choir at HPUMC, and she especially finds it special to sing at funerals. The first time Missy attended HPUMC was actually for a funeral (after being away from the church for over 20 years). She later joined the church and has now been singing in the choir for 17 years. Her family and grandchildren now are a big part of HPUMC, and Andi Fancher, Director of HPUMC Kids, is Missy's daughter! Have you ever recorded a compact disc? Yes, we have a CD that was recorded in the spring of 2012 called One Faith, One Hope, One Lord, which is available for purchase. Proceeds from sales will go toward the music ministry missional efforts. The CD comprises recordings of favorites movements from masterworks, as well as ‘choir favorite’ shorter anthems. Learn more about this project and other opportunities to support the choir here.